Winter is nearly over, and we are about to come into Spring – Is it the perfect time to detox? Every day we are bombarded with the consequences of life in the 21st Century. Breathing toxic air, ingesting chemicals through the foods that we eat, the water we drink, the products we clean our house with, and even the skin care products we use on our bodies. Research has shown that babies are now being born with traces of over 200 chemicals in their umbilical cord blood. All of these chemicals we carry have to be filtered and detoxified from our bodies so that any harm they cause is minimized. Spring…. the time of the year that nature brings about new life, and there is a sense of freshness and a shedding of the constraints of winter. As the weather warms, it is the ideal time to begin thinking of our bodies. How we can shed a few kilos, improve our energy, and bring a new glow to our skin. Thankfully, our bodies go through the processes of detoxification and cleansing via the liver, kidneys, lungs, skin, bowels, and lymphatic system every day. 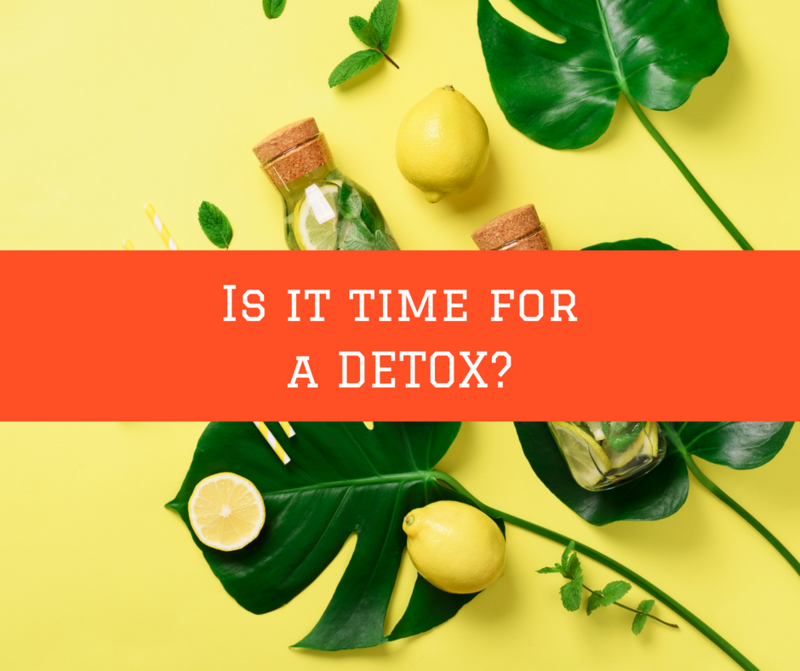 These detoxification processes help to keep us reasonably well, by breaking down and removing many of the toxic substances that would otherwise, be extremely detrimental to our health in the long term. However, if our detoxification processes are hindered for different reasons, our body will end up storing, (usually in fat cells), what it can’t eliminate. This can lead to weight gain, feeling tired and sluggish from an overburdened liver, depleted immunity, and possibly even outbreaks on the skin. One of the things we need to do is look at how we can maximize the processes of detoxification that naturally take place within our bodies. Using simple remedies such as: starting your day with the juice of half a lemon in a glass of warm water and a pinch of cayenne pepper; drinking roasted dandelion root tea a couple of times each day; or taking milk thistle can help the liver do its job more efficiently. Also, if there is a problem with constipation, this must be addressed, otherwise toxins can be reabsorbed and moved around the body again, adding more of a toxic burden to an already struggling system. Sometimes, constipation occurs simply because of dehydration, so by increasing your water consumption, things can often ‘start moving’ without any other help. Firstly, attending to your diet should always be the foundation of any detox program. Removing things such as take away food, sugar, soft drinks, alcohol, products made from white flour, refined processed foods, and coffee, can have a dramatic effect on how you feel, as well as your energy levels. Increasing your consumption of fresh vegetables and fruit, as well as whole grains, nuts, seeds and high quality protein and fats will help to provide you with micronutrients, phytochemicals, minerals and vitamins. These are all needed for the biochemical and detoxification processes that take place in your body every minute of every day. You can do this by adding green smoothies or juices that are made with fresh green veggies and some fruit, along with a good detoxifier such as spirulina, chlorella, wheatgrass, barley grass, or a blend of them all. And don’t forget to make sure you are drinking at least 2 litres of pure, filtered water every day in order to prevent constipation, and to flush out the toxins that are released. Along with adequate water, something else that helps remove toxins and heavy metals from our bodies, is fibre. Fibre was the ‘superstar’ of the 70’s, everywhere you turned, someone was talking about it and for good reason. Two of the ways fibre helps the body’s detoxification processes, is through binding to toxins and carrying them out of the body via the bowel, and providing bulk for healthier bowel movements, helping to alleviate constipation. It really is still a superstar! For those who want to pursue a more comprehensive detoxification program (or you are doing one for the first time) our qualified practitioners are the perfect people to talk to. They can tailor-make a program to suit your body, your schedule and even your budget.